It's been so incredibly dry here in Michigan this summer ...our grass is brown, the flowers growth has been stunted, and the wildlife are searching for moisture. Each morning, I find my birdbath tipped over, as if some creature has toppled it on himself for a cold shower in the night! 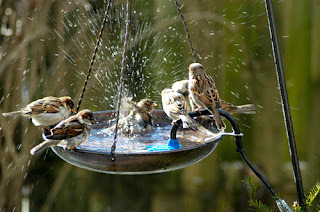 As soon as I fill it up, birds gather eagerly, waiting their turn to splish, splash around.